This is version 1.0, just started an idea, let me know what you guys think I should change. Looks clean! Layout could be experimented with but other than that; good job! Great job! I also make some experiments on that field right now but prefer to use screencapture.com to share my works with team and decide problems together. Still feel like you need to change color, but it is only my point of view! I'd expand it by having multiplie video players, making it to a row. That way you could advertise multiple subjects at once! There is not really anything on the left side, just blank space being wasted. 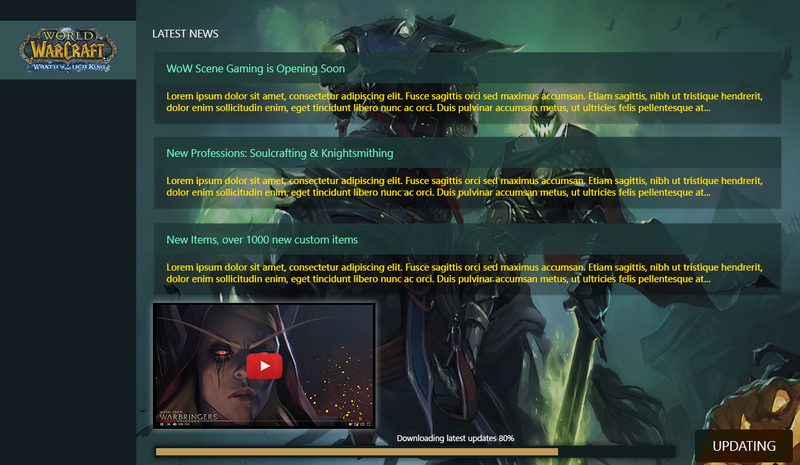 Perhaps filling it up with minor patches, news, guides or something else. In addition, (maybe because I'm slightly colorblind), the colours only has a little harmony with each other. However, the loading bar is very good (minimalism) and if possible, make the pumpkin in the corner to the button! It looks really quickly thrown together without much planning or thought put into the design. I don't care for the background image or the colors used. Judging by the random WOTLK logo on the left I will take a guess it is WOTLK server, so why not use a background that has syngery or realation to WOTLK. IE Lich King or something of that nature. The random Horseman image is more Halloween themed, and it just seems out of place IMO. The yellow text used doesn't compliment the background either, makes it look tacky and stand out. I would have used the lime green flame color from his sword. Or just kept it clean and used off white. Hope this doesn't come off as rude or condescending, just trying to give constructive criticism, good luck.